Written by: sarahwagner on October 15, 2014. My mom was the queen of Halloween. Every year we would make several little crafts and we’d make them in bulk so she could give them to people who she’d come across that, in her words, had the Halloween spirit. Ghosts and Jack O’Lanterns were the favorites, in part because they were easy enough for me (who has zero artistic skill) to do. 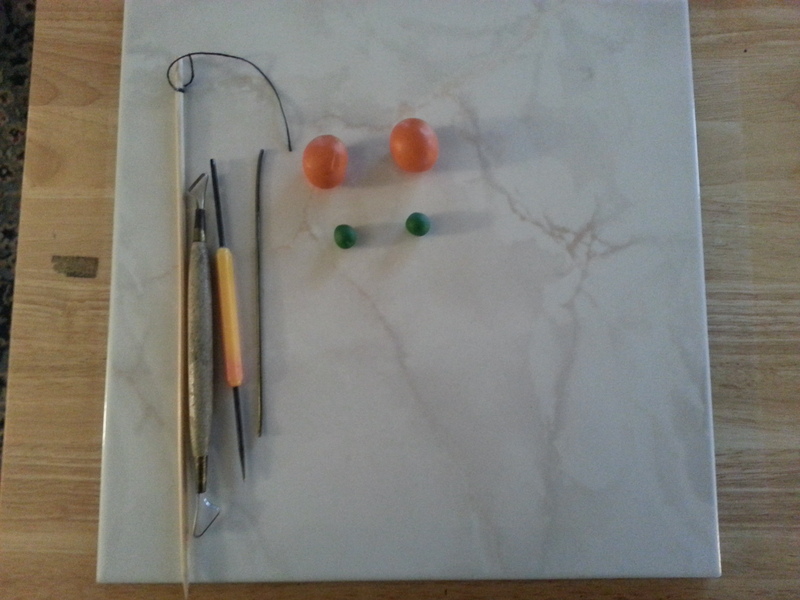 Supplies: orange and green polymer clay, cookie sheet, about a five inch length of large wire (like hanger wire), skewer, either a large needle or thin pick type tool, and a rounded edge shaping tool. Roll orange clay into a ball and press it flat. As you flatten it, shape it into roughly the shape of a pumpkin. Make a stem with the green clay. I find that it’s easier to attach when you have a thin edge to fold over on both sides of the orange. Use the needle or pick to punch out the face. Using small holes around the outside of the shapes, you can carefully dig out the clay, much like you would carve an actual pumpkin. Use the shaping tool to add lines through the face like a real pumpkin has. Run the skewer through the top of the pumpkin, either front to back or side to side. Replace the skewer with a length of wire (to keep the shape of the hole during baking). Bake for about an hour (depending on thickness of your pumpkin) at 275º F.
When completely cooled, you can thread your pumpkin on ribbon, lacing, or string. 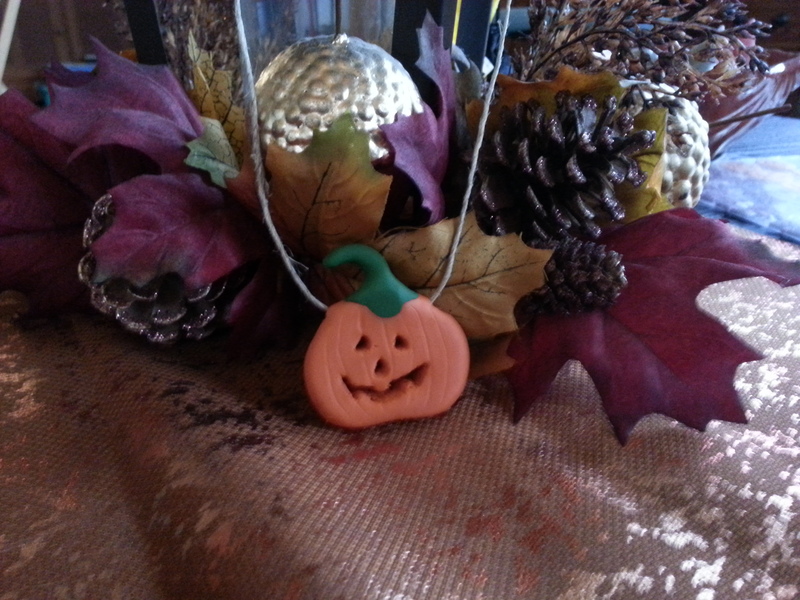 I’ll be using the one I’ve made here as part of a wreath I’m working on, but they make cute jewelry too. The Jack O’Lantern shown is approximately 2 inches by 2 inches, including the stem. The best part of working with something like polymer clay is that if you don’t like it, you can redo it until you do!